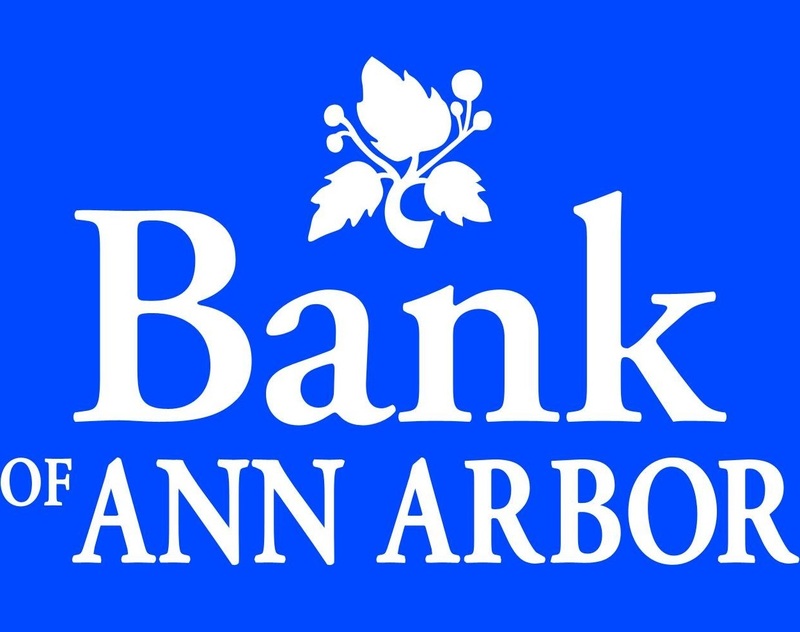 Today’s Member Spotlight focuses on Bank of Ann Arbor from Ann Arbor, Mich. In the following interview, President and CEO Tim Marshall explains what is unique about this local community bank. Several things come to mind for Bank of Ann Arbor. First, we work hard but have some fun at our bank. Our playful marketing efforts have captured the attention of our local community. Our employees enjoy living that brand out in their day-to-day interactions with each other and our clients. We just purchased a 1977 Granny Smith apple green VW bus to drive around town to events and activities. It goes perfectly with our supply of apple green Converse Chuck Taylors. Second, with the skillful and hard work of our team and the support of our community, we remained profitable during the economic downturn and have set new records of profitability for the last five consecutive years. Guess having a little fun is good for the bottom line. One of the special gifts we provide to our community is our Sonic Lunch concert series. Each summer, we invest time, money and employees to create a lunch time concert in a downtown city park that’s free for all who stop by. Over the past seven years, Bank of Ann Arbor has brought over 70 incredibly talented national and local performers for thousands of people to enjoy. Sonic Lunch has now become an integral part of Ann Arbor summers. One of my favorite experiences was from Sonic Lunch. Our performers for the day were none other than Rock and Roll Hall of Famers Martha Reeves and the Vandellas. As I was talking with Ms. Reeves before the concert, she said, “since you’re the bank president, could you cash these postal money orders that I have with me so I can pay the band?” In true community bank fashion, I walked Ms. Reeves over to our main office (which was only two blocks away) and introduced her to our branch manager. Making a little exception to our usual procedures, we made Ms. Reeves happy enough to be “Dancing in the Streets” with all of Ann Arbor. A moment that I am particularly proud of represents a win for our whole team. In 2012, Bank of Ann Arbor was named as Company of the Year by our local news media. This award represented recognition by our community that we were not just an ordinary bank or company. It recognized the tremendous work that our bankers did to manage expenses, make wise loan decisions and grow banking relationships. It was so humbling yet exciting for our team to be honored with this award. There is a local nonprofit that provides medical services to the less advantaged population in our community. The nonprofit was anxious to provide more and better services to this population and began to expand and renovate its existing facility. Unfortunately, this was a classic case of getting the cart before the horse. No financing had been secured, historical cash flow would not support the size of the project, and fundraising was just getting started. Being true to our community bank roots, we worked closely with the organization in stabilizing the building to get through the winter months, helped them refocus all of their attention on the fundraising effort, and we were able to approve the loan the following spring. The building project is complete, the loan has been paid off, and there are more people using the services of this nonprofit. How do you celebrate Community Banking Month? We celebrate by helping to spread the word about the importance of community banking through our social media efforts and by supporting our team of the World’s Best Bankers as they serve our community. 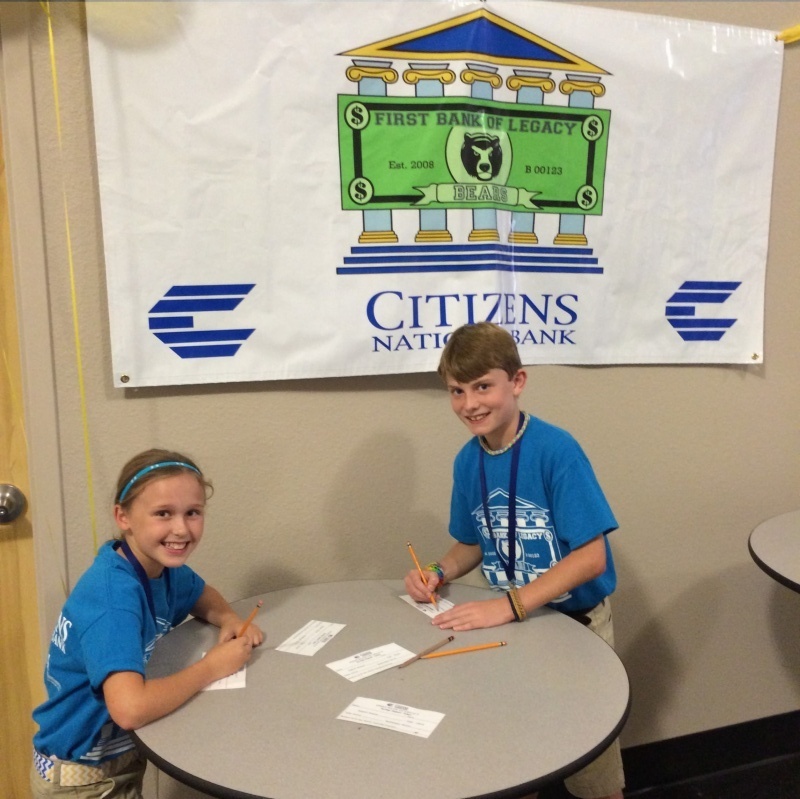 For the past six years Citizens National Bank of Bossier City, LA has implemented “Bank @ $chool” programs at several elementary schools in their community. 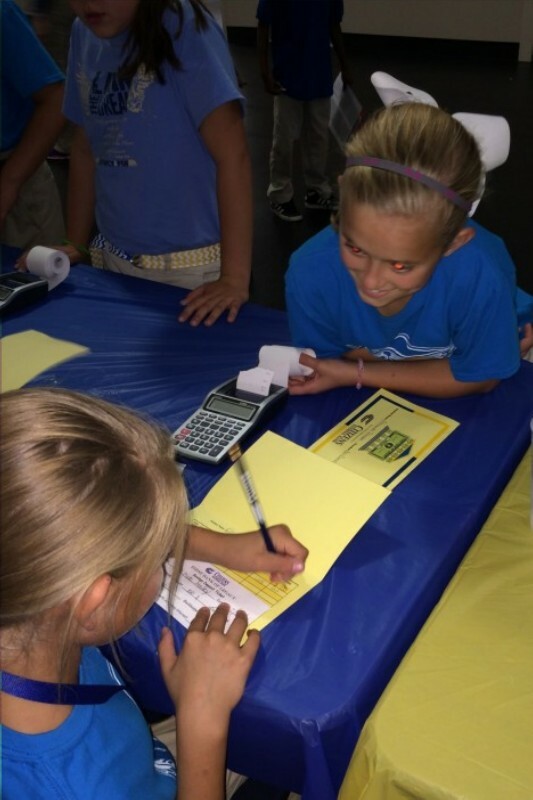 Josie completes the passbook by entering the interest earned and updating the balance which she tells that amount to Ella Kate who is excited to watch her savings grow! First, the Bank provides financial literacy curricula to each school’s fourth grade teachers. The curricula is real world based and developed at an age and grade appropriate level. Second, once a month during the school year Citizens staff members visit the school for “Bank Day.” Bank Days give opportunities for students to serve each other as tellers, bookkeepers, security guards and branch managers; as the entire grade level brings their saving deposits. Tellers accept the deposits, while bookkeepers balance the account and calculate the interest earned. At the end of the school year, students can convert their school account to a real Citizens savings account or get a check back for what the accumulate during the year. Kennedy, Davis, Logan and Molly are prepared for our First Bank of Legacy deposit day. They were chosen to be security guards and Branch Managers through an application and interview process just as you would have done in the real job world. 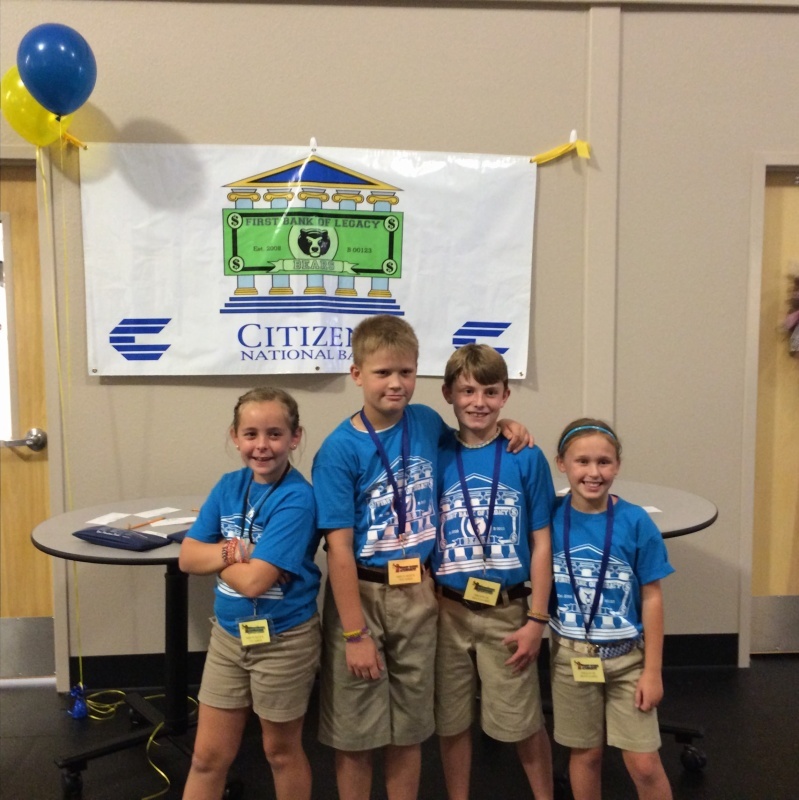 Since beginning the program, Citizens has worked with more than 2,000 Bossier Parish students. The believe – and hope – is that these students are developing a solid foundation in financial literacy. After Molly’s deposit slip is complete, she proceeds to the teller, Korbin, who verifies the money and gives her a receipt. 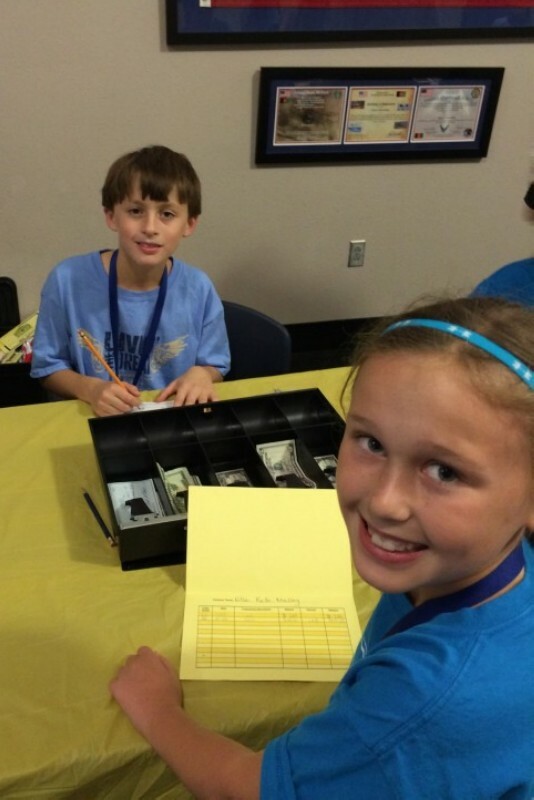 Molly and Logan fill out deposit slips before making their deposit with the tellers. Teachable Moments: Look for ways to turn everyday experiences into teachable moments. A routine trip to the grocery store could turn into a discussion about the importance of budgeting and how to identify wants versus needs. Earning Money: How children earn their money is up to their parents, but it is important that once they’ve earned it they understand it is a limited commodity. If your child spends all his or her money and asks to borrow more from you, don’t give in and spoil a valuable lesson. A Tiered Savings System: When teaching children about money, it is suggested that parents institute a tiered system that allocates money for spending, long-term goals and charity. By automatically taking 10 or 15 percent off the top of their earnings and designating it for savings, children can develop the habit of paying themselves first at a young age. To view all of the tips and the rest of the press release, visit www.icba.org.